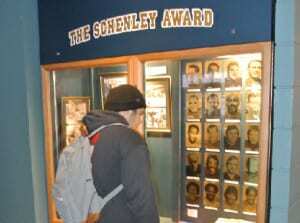 Cannot make it to the Hall of Fame? Why not let us come to you? We have travelled all across the country from Moncton for Atlantic Touchdown to Vancouver for the Grey Cup. The display case rental is one way to bring the history of Canadian Football to your event. The display cases that we use can fit various artifacts that include: vintage jerseys, helmets, and footballs just to name a few. We can match the theme of your event, like how we matched the celebration of the 100th Grey Cup in Toronto in 2012, or during our Moncton trip in 2011 when they were celebrating Atlantic Canada football. These display cases are for all levels of football, which includes junior, varsity and professional. 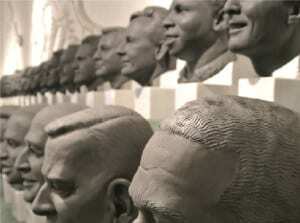 Our member busts can also travel on the road to your event. It can be stand alone or it can be part of the display cases. Accompanying the busts will be will be printed biographies showing the player or builder achievements they achieved when they were enshrined into the hall. Whether it’ll be Hugh Gall or Roger Aldag, this is the perfect way to have a CFHOF member at your event. In Ottawa for the Ottawa RedBlacks name unveiling. CFHOF Golf Tournament at Glen Abbey in Oakville. Commonwealth Stadium in Edmonton for Induction 2013. The Metro Toronto Convention Centre for Grey Cup 2012. Limeridge Mall in Hamilton for the Hamilton Tiger-Cats uniform unveiling. Sunnybrook Hospital in Toronto for a history of the Toronto Argonauts. Canad Inns Stadium in Winnipeg for Induction 2012. 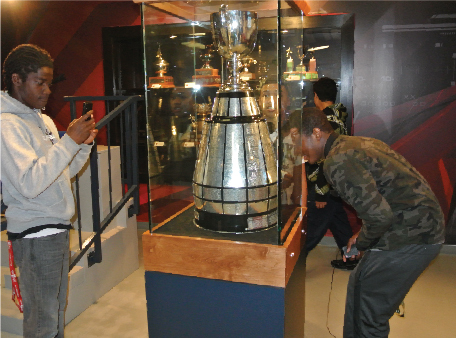 For more information on pricing and availability, please contact Mark DeNobile at (905) 528-7566 or email Mark@cfhof.ca. $150.00 staffing fee (includes set up and take down, and duration of the exhibit). $70 per day Diem for the staff member.- Travel/Accommodation of staff. 50% deposit is required and the other 50% upon set up on the exhibit. Cancellation of the exhibit with less than 48 hours’ notice will result of loss of deposit, plus a charge for any expense incurred by the Hall of Fame in preparation the exhibit rental. The renter shall provide a secure area to be used for storage, as well as a loading dock to be used for the shipping and receiving of the exhibit. The renter shall provide 24 hour security of the exhibit at his/her expense.